We’re turning our balance sheets into a learning lab for college and community media. The Daily Tar Heel is a news organization, and we don’t dodge the facts: This 123-year-old institution has two years to figure out its finances. This is not the first thing a new general manager wants to say to her community, but there’s only one way forward that I can see, and we have to take the direct route. The course we’re setting demands candor, collaboration and creativity. Let me offer you a little of each. Proud celebration of our 120th anniversary in 2013. Since 2011, the DTH has operated with a deficit, shortfalls that were filled in by our investment accounts. In recent years, the annual deficit has hovered north of $200,000. When I was hired earlier this month, our investment accounts were just below $400,000. Our investment fund’s strength obscured the fact that the DTH was slowly approaching the same moment that has shaken every legacy media organization in the world. I am not making light of our financial situation when I say that there is something marvelously concentrating about financial reality. The will of this organization has turned toward solutions. The Daily Tar Heel is rare in student media: We are the independent, nonprofit media lab for the University of North Carolina’s young journalists, advertising pros and creative talent. We don’t receive money from the university — we earn every penny we spend — and we are led by a majority-student board of directors. The editor-in-chief, who is always a student, has complete control of our news content. That’s a tradition. We have many. 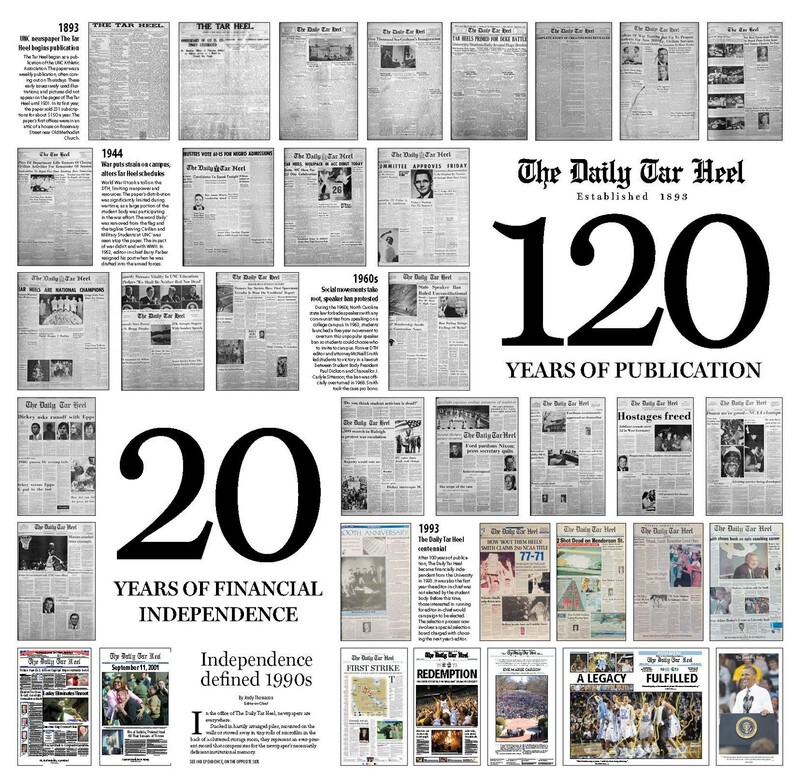 In 2018, The Daily Tar Heel will celebrate our 125th year. We’ll do it in start-up mode. WHAT’S GREAT: We have a lot of legacy assets, including a national reputation for excellence; a position as the primary news source for the university, Chapel Hill, Hillsborough, and the surrounding counties; a deep roster of creative and talented students; and plenty of infrastructure. WHAT’S HARD: We also carry legacy costs, particularly a business model that relies on printing and distribution as a way to serve the advertisers who support our journalism. WHAT’S HAPPENING: Starting next week, The Daily Tar Heel will eliminate our Tuesday print edition. It’s the first of many steps that will help us extend the two-year runway for our launch into the future. I want to spend a little time on the concerns behind my recommendation and the board’s vote. Journalists and their communities both feel the literal and metaphorical heft of words and photos created, edited, fact-checked, and ultimately printed on paper. The printed word signals investment and significance, even when, as with newspapers, the entire thing changes every day. For most young journalists, it’s an honor and a responsibility to hold a newspaper with their work in it. One challenge of the digital cataclysm is how to convey that sense of power and civic pride to every generation when digital publication is available to anyone with access to the internet. As we move to all-digital Tuesdays, we’re challenging ourselves to find new ways of serving the community. (Read Editor-in-Chief Jane Wester’s thoughts on this point.) We want to deliver powerful, fascinating stories that use the full potential of video, audio, images and words. While we expect to make other sacrifices in order to extend our runway for experimentation and development, printing four days a week will be the most visible to our community. I’ll start with a pitch: The Daily Tar Heel is an independent, nonprofit organization with 501(c)(3) status. One way that we hope to collaborate is by asking our donors and supporters to identify what they most value about the DTH by supporting a section of the paper (what we call a “desk” here — the university desk covers campus, “statnat” covers state and national news) or a particular mission. We’re taking a page from public media: Our journalism is always free, but we expect to provide DTH supporters with benefits, including pre-season conference calls with our sports staff, and early or discounted access to our workshops and events. We’d like your help right now. But the help is not just for the DTH. The Daily Tar Heel’s challenges are new to us, but they’re not unique. Community journalism — the act of putting questions to power, watchdogging, and sharing a community’s knowledge and stories — is a fundamental civic activity. It also takes a lot of time, or a lot of money, and sometimes both. News organizations across the world share the question of how to support this undertaking. In Chapel Hill, we’re lucky: Our peerless asset is a motivated group of students who write the news, sell ads that connect the business community to campus, and create marketing, advertising and brand services for local agencies, nonprofits and businesses. They are an enviable resource. We want those resources to benefit our neighbors, employing some of our under-used assets (space, expertise, creative capacity) to help those around us solve their problems, either by trading resources or charging modest fees for our services. NEW SECTIONS: We have long and often been asked why The Daily Tar Heel doesn’t provide engagement, wedding and anniversary announcements, or obituaries. Starting Sept. 19, we do. NEW OR EXPANDED SERVICES: We’re in a pilot phase now; in 2017, The Daily Tar Heel will launch a creative services agency — a group of skilled, creative students led by an experienced agency director, offering graphic design, video, photography, social media and sponsored content creation to the business community at a range of rates, and with DTH excellence. We’ll also help local business create powerful, meaningful ways to connect companies to the campus — whether it’s inviting them to sponsor DTH and a Doughnut or adding tiers of options at our fall and spring Heels Housing fairs. NEW EVENTS: This fall, The Daily Tar Heel will pilot events for the communities in our coverage area, which will expand into a full calendar in 2017. Our focus, as always, is on public service, storytelling and education. These events — many of which will be free to the people who attend — reflect that our readership includes students, professors, and longtime residents and neighbors. A “Swerve” story slam to launch our new arts-and-student-life project and collect stories to fuel it. An iPhone video workshop for athletes and their parents, with a short information session about a relevant, sports-related skill or topic from a sponsoring local business or organization. We’re going to offer our customized workshops across the community, which will let us deliver self-identified, high-interest consumers to the sponsoring business, and to create advertising around the event and its sponsor. We’re also developing classes and training camps that capitalize on and sharpen our core skills: workshops for writers, photographers, designers and storytellers across media in the campus community and beyond. The Daily Tar Heel, steeped in history but led by students, has always turned its face toward the future. The years ahead are no exception. If you want to follow along as we try, fail, succeed and study our own efforts to keep improving, watch this space. And thanks for joining us. Betsy O’Donovan is the general manager of The Daily Tar Heel. She is an 18-year veteran of community newsrooms, an editorial adviser in the public media system, and was a 2013 Nieman fellow at Harvard University, where she studied media business models and storytelling.